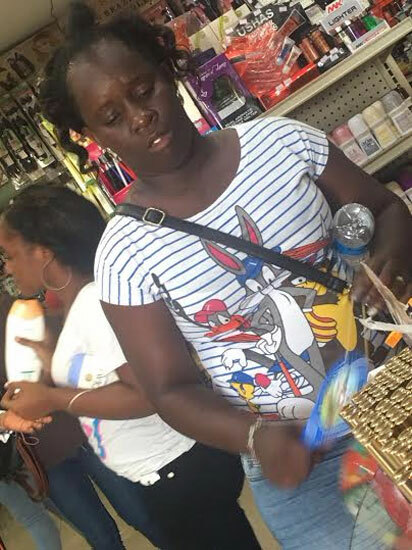 Despite knowledge of the fact that their images and actions are being captured on Close Circuit TV, some individuals are bent on entering Lucky’s Cosmetics at the Palm’s Building in downtown Basseterre with intent to steal. Last Friday (Jun. 24), The Observer was summoned to the business establishment, where a male employee, Sagar Ealreja, disclosed that a woman had stolen a bottle of Bio Oil and the matter was reported to the police. Recounting the event of that day, Ealreja said the woman had entered the premises at about 4:00 p.m. and went directly to the shelf where Bio Oils and other items were on display. The employee stated that the woman had a bottle of Bio Oil in her hand and she went to to the cashier to whom she paid for the item and immediately left the premises. However, in an effort to confirm his suspicion, the manager checked the footage on the security cameras and discovered that the woman had stolen an item from the store. “When Sanjay checked the cameras, we saw when she picked up two bottles of Bio Oil. She put one under her arm and had the other in her hand. She then looked in various directions and not seeing anybody looking at her, she put one of the oils in her handbag. He explained that because of the rush hour, the manager could not have monitored the cameras while the woman was committing the act. However, he viewed the footage some 15 minutes after her departure and a report was made to some police officers who were in the vicinity. According to Ealreja, this is not the first time that persons had shoplifted from Lucky’s Cosmetics. When contacted for a comment, the Police Press and Public Relations Officer told The Observer that he is unaware of that incident.